With the introduction of the Volvo 144 in 1966, Volvo took a giant leap safety wise. Amongst other stuff, this car possessed disc brakes all around, a telescopic steering column, and an improved seat belt buckle. Both in the front and the back, the Volvo 144 had energy absorbing crumple zones. In Sweden, the sedan was soon called car of the year. Also in export markets, the Volvo 144 and its sister, the station wagon 145, were a success. The advantage of the car was that it met the requirements for a new set of safety standards in the United States, even before this was published. 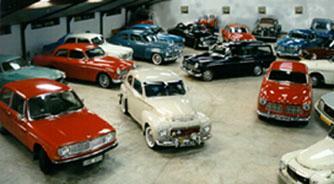 In 1975, the Swedish Automobile Association awarded Volvo a gold medal for safety provisions for lights and brakes.